Pole in the Park™ in Union Square in NYC last week brought some of the best pole dancingt talent to the street. Put on by the American Pole Fitness Association whom had teamed up w/ All Star Stages™ for an event that will go down in history as the first public pole dancing event. All Star Stages along w/ Pole Spin Magazine and others wooed the crowed from 12-6 pm in Union Square which prompted Reuters among other media like NBC and NY Post to appear and report the news internationally. Below you will find a collaboration of dance talent that appeared in Pole in the Park™. 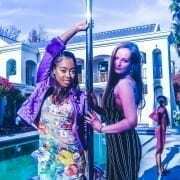 All Star Stages™ is a nationwide professional dance pole rental company headquartered in Los Angeles, California w/ offices in San Francisco, Miami, Las Vegas and New York CIty as well. Dance Pole Rentals are available by contacting All Star Stages at 800.983.6640 or visit here. All Star Stages™ 2016	Bachelor Parties are Renting Stripper Poles in Breaking Numbers! What to Do B4 and After Pole Dancing Class? All Star Stages™	Did Peekaboo Pole Dance Co Ever Make Nintendo Wii STRIP Game?